The average rate was 84%, he report suggests. 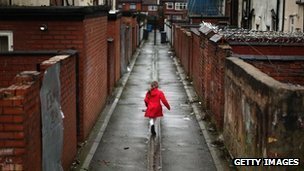 The UK has one of the highest rates of family breakdown in the Western world, with just 68.9% of children living with both parents, research suggests. The UK comes fourth in the Organisation for Economic Co-operation and Development (OECD)'s table, behind Belgium, Latvia and Estonia. The figures compared the living arrangements of children aged 0-14 in 30 OECD member countries in 2007. Finland had the most children living with both parents, at 95.2%. The lowest percentage of all was in Latvia at 64.9%; Germany stood at 82%, Italy at 92.1%, Spain at 91.5% and the US on 70.7%. The the average was 84%. They also show that the proportion of children living with their mother and not their father in the UK is 27.6%, while for those living with only their father is 2.4%. Only Latvia has a higher percentage of children living only with their mother, at 30.2%. The Marriage Foundation, a campaign group which champions marriage, said the statistics were symptomatic of an "appalling epidemic of family breakdown". Its communications director Harry Benson said they should "convince politicians of all colours of their utter failure to deal with the central social problem of our times". "The latest UK data tells us that 450 of every 1,000 children will experience the break-up of their parents before their 16th birthday, largely the result of the trend away from marriage, in particular the collapse of unmarried families," he said. Family breakdown costs the government £44bn per year, he said, but "the government has no policy whatsoever to reduce or prevent the continued rise." Christian Guy, managing director at the Centre for Social Justice, an independent think tank, said "timid politicians " were becoming numb to Britain's "sky-high family breakdown rates". "All kinds of transformational help can be offered to parents and couples when they come under life's pressures. It is time for people who oppose things that would stem the tide of breakdown, such as backing marriage as the most stable path for children, to stop playing politics. Our forgotten families need all the help we can offer," he said. Secretary of State for Work and Pensions Iain Duncan Smith said family breakdowns could have a devastating affect on a child's life. "We have already invested £30m in relationship support, to prevent family breakdown rather than waiting to pick up the pieces," he said. "Across government we're working to improve the support available for families who experience abuse at home by more effectively punishing the perpetrator and doing more to educate young people about domestic violence."